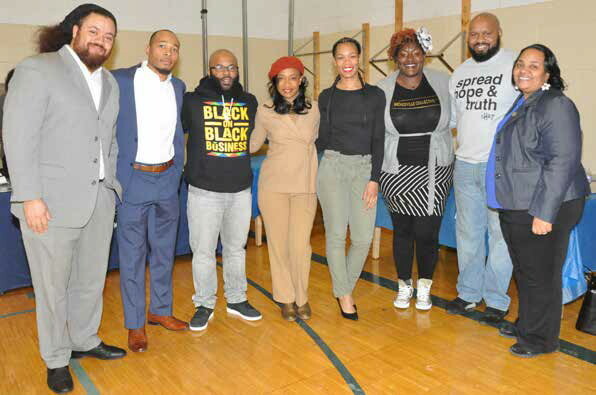 On Saturday, January 26, 2019, MKE Business Now hosted an Entrepreneurship Summit at Dr. Martin Luther King, Jr. Elementary School, 3275 N. 3rd Street. The summit was a showcase of resources available to help launch Milwaukee’s next great business ventures and an opportunity to connect with established local professionals. The event was sponsored by Alderwoman Milele A. Coggs, the City of Milwaukee, the Historic King Drive BID #8, and U.S. Bank. The event featured vendors and organizations that had resources available for the attendees. The event featured a panel discussion moderated by Andrea Williams of Jammin’ 98.3. Pictured at the event are (from left) Mr. Dye’s Pies owner Johnathan Dye; Dream Builders, LLC owner Nick Robinson; Words & Images Milwaukee State of Mind owner Terrelle Harris; MC Andrea Williams; Embody YOGA owner Joanna Brooks; Fly Blooms and the Bronzeville Collective owner Tiffany Miller; Funky Fresh Spring Rolls founder Trueman McGee; and Alderwoman Milele Coggs.